Makki di roti is a delicious Punjabi flatbread made of cold corn flour and cooked ghee. Using Dhanraj Makki Da Atta, enjoy the hearty flavors of Punjab with the world-renowned, classic combination of makki di roti and sarson ka saag. Makki di roti also goes well with other dishes and can also be eaten with a hot cup of Indian chai. 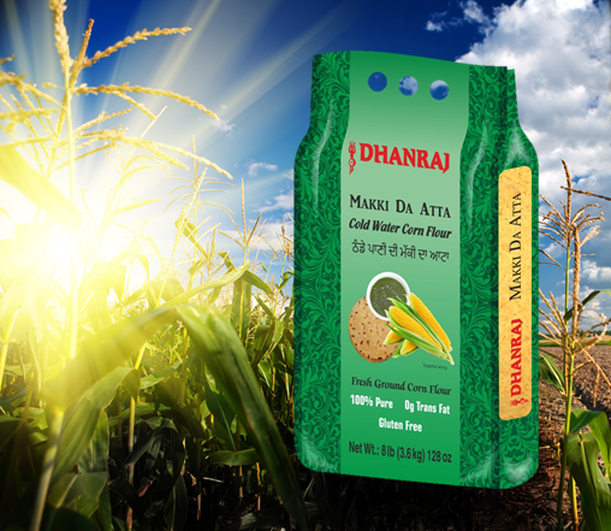 To make Makki di roti, add salt to Dhanraj Makki Da Atta (Cold Water Corn Flour) and mix well. Add water and knead to make a medium-soft dough. Divide the dough into equal portions and shape into balls. Roll out each ball between the folds of a greased plastic sheet or a cloth. Heat a tava, or flat pan, and place the roti on it. Cook on medium heat till one side is half done. Flip the roti over and spread some ghee on it. Repeat for the other side. Cook the roti until both sides are golden brown and serve hot with ghee.